Here is part five of my non-fiction work about the National Radio Astronomy Observatory in Green Bank, West Virginia. You can also read parts one, two, three, four, six and seven. Senator Byrd (1917-2010) was a consummate politician. He was from a very poor state – West Virginia. He served in the Senate for over 50 years. He was the longest-serving senator and the longest-serving member in the history of the United States Congress. While in office, he used his seniority to help his home state. As such, there are a lot things in West Virginia named after him. He was directly responsible for obtaining the funding for the GBT. The actual shovel used during the groundbreaking ceremony for the GBT by Senator Byrd is encased in a display box in one of the NRAO lobbies. If you happen to see it and notice it’s a bit short and also very shiny, here’s why: Senator Byrd used a normal, brand new shovel at the ceremony; afterwards, NRAO chromed it and also had the handle shortened, so it could fit in the display case. “Senator Byrd went up to the podium and gave his dedicatory speech. He is a very good speaker. He frequently cites the Bible during his speeches. While you sit there, wondering where he’s going with all the stuff he talks about, he draws it all together in the end and it starts making sense to you. The National Science Foundation dignitaries were gathered there, as well as some of the local politicians, and also all of the NRAO big wigs. A public reception was held at the site after the ceremony, where the local population was invited. All of the suits gathered quickly around the Senator at the reception, trying their best to hobnob. The Senator’s reaction was priceless. He laid his hand on the NRAO Director’s shoulder, and said, “George, take all these people away and leave me alone!” He would not let any politician or dignitary come within 20 feet of him the rest of the day. He stood in the sun, on the pavement, for 2 hours, and shook hands with every local person that was there. Meanwhile the suits went over to a table set up for them and pouted. Well, as the reception drew to a close, Senator Byrd pulled out his fiddle and played with one of the NRAO employees, then stood up and left. The total funding for the telescope came to 75 million. Fifty-five million went to the contractor for building it to the NRAO specs, and NRAO got the rest of the money to build the receivers, monitors, and other equipment that went along with it. After the telescope was built, NRAO needed to go into binding arbitration because the contractor wanted more money – 20 million more to be exact. In the end, they got almost 4 million – not their ridiculous figure – thanks to the arbitrator. The whole room is enclosed in copper sheeting and copper fabric – the walls, ceiling, floors and even windows have copper over them. The room is what they call a Faraday Cage. 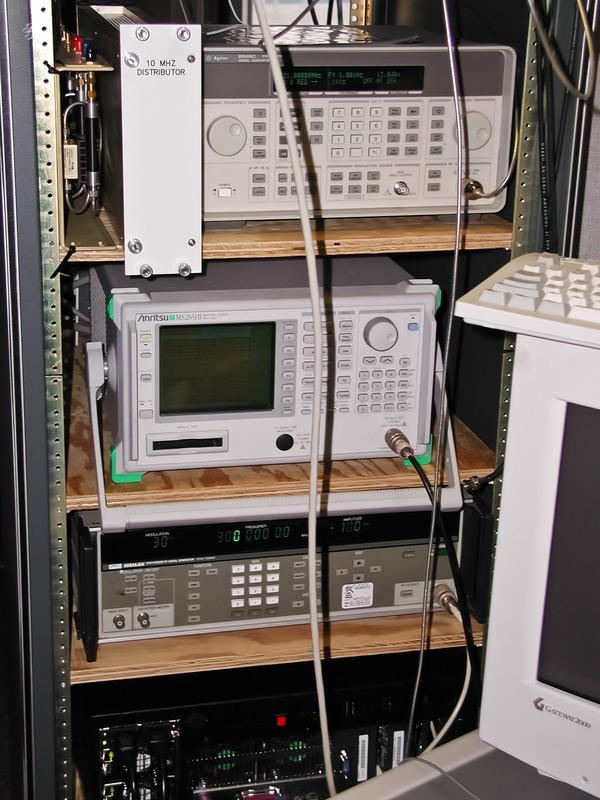 It attenuates signals inside by 60 dB at 1 GHz. That’s not sound waves, it’s radio waves. You can also measure radio waves in decibels. The windows have a thin brass wire lattice, so light can penetrate. Here we get into some more murky ground. To most radio waves, the lattice wire is a solid wall. The smaller the wavelength, the more likely it is that the radio signal will pass through. As computer processors increase in power, the wavelength of their radio signals gets smaller, since the frequency of the processors increases. That means that soon enough the wire lattice for the windows won’t suffice anymore to block out the radio waves generated by next-generation computers. 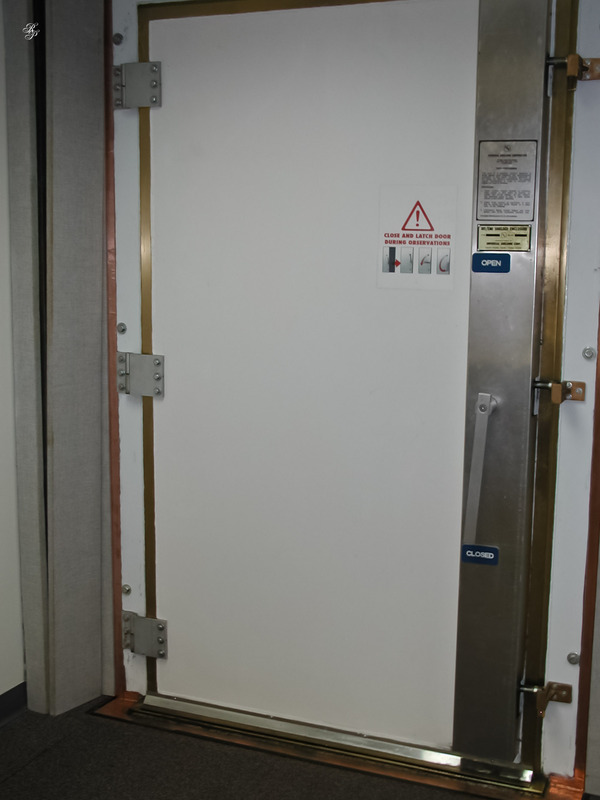 Even the door is made of copper and has a brass doorstep, on which Mr. Sizemore cautioned me not to step – apparently they need a tight seal and brass is pliable. Stepping on it would dent it. There are also copper “fingers” between the door and the doorstep. They need good contact between the two, and denting or dirt from your soles will prevent it — that’s another reason why it’s best to step over it as you enter or exit the room. The reason for this is that the equipment generates radio interference. Since there’s a direct line of sight from the control room to the GBT, the only way to minimize that is to make the room into a Faraday Cage. Here’s a tale of woe about the windows. The contractor “screwed up the execution of the design in any way possible”. One of the main problems was the use of copper fabric on the walls. They applied it to the wall with a water-based adhesive. Now the fabric is slowly turning green. The copper is turning into copper oxide, which is not as conductive and is also poisonous. Around the windows, they don’t have that problem, they have another, which is worse. Nathan, one of the technicians, and Mr. Sizemore had to re-do all of the windows. They had to take all of the windows apart down to the metal and send all of the framing off to have it nickel-plated. They also replaced the copper fabric on the walls around the windows with nickel fabric. If you put nickel and copper together, the electrolytic action isn’t as bad and it doesn’t corrode. 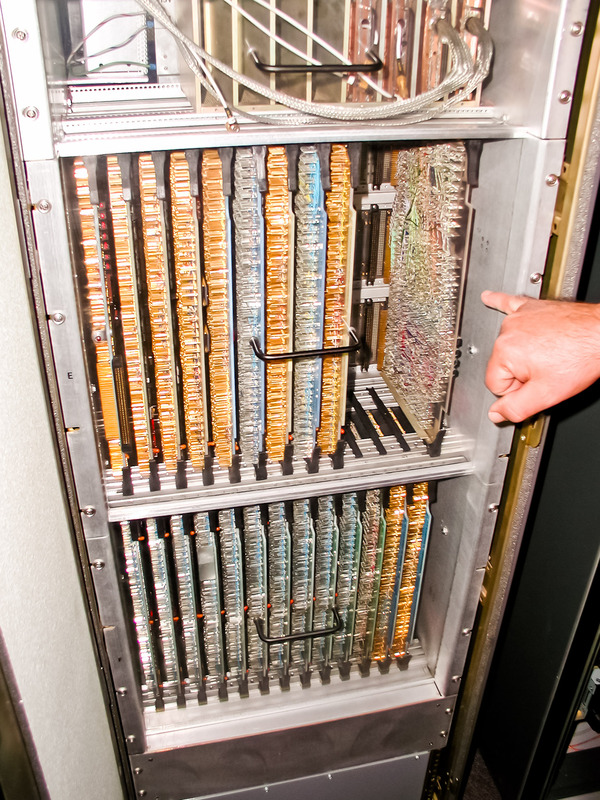 When they were refitting the windows in the GBT control room to do away with the “battery effect”, they had to do a lot of banging. As they started away in the morning, they banged at the frames for about a half hour or so, until Phil Jewell, the Deputy NRAO Director, whose office was directly underneath, walked in to see what was going on, with a confused look on his face. Nathan couldn’t resist: “Hey Phil, did we wake ya?” he spouted, a huge grin spreading across his face. Wesley was quiet as a mouse, not knowing how Phil would react to Nathan. Thankfully, Mr. Jewell just grinned and walked away. 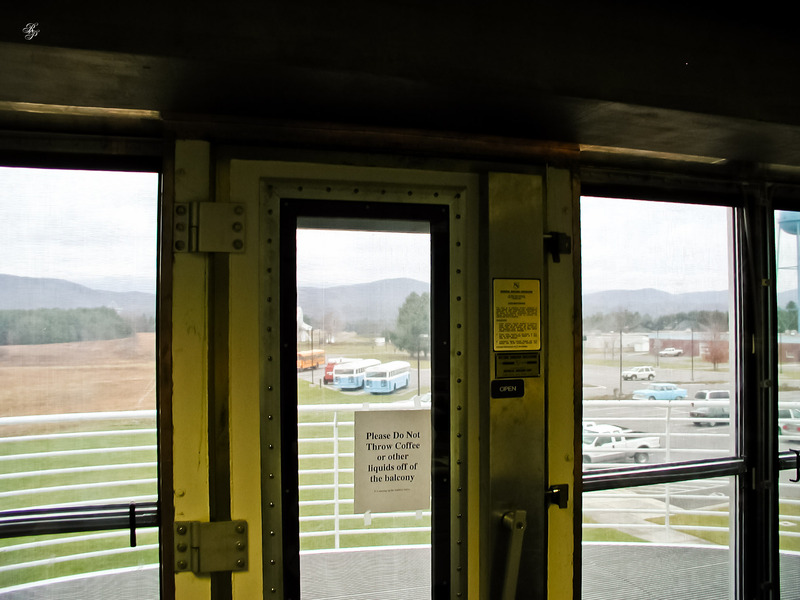 They still had a problem with the sweating on the windows, which they needed to alleviate, since they were still made of metal that could corrode over time, though at a much slower rate than before. Some of the scientists on-site got together and offered a bunch of “solutions”. One of them was to put Plexiglas over the windows to keep air circulation to a minimum. But then another decided to drill holes in the Plexiglass to keep the air circulating through, since the sweating still occurred. They then used a fan to blow air over the windows to cut down on the circulation. Not very practical! The final solution was offered by one of the technicians, who happened to live in a mobile home. For those of you who haven’t had this experience – including me – windows sweat a lot in mobile homes. He went to the general store in town and got a little window kit from 3M. It’s film that is applied to the windows and shrunk with a blowdryer. 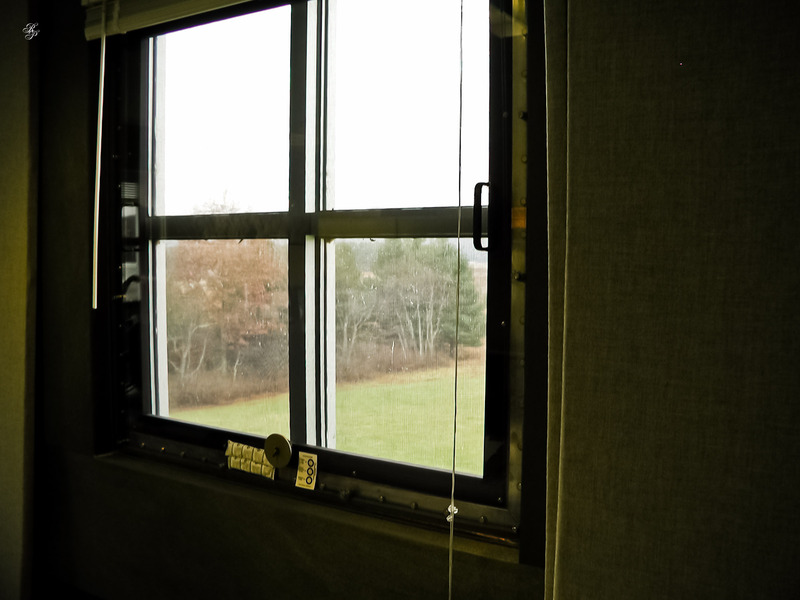 After the fix was proven, the 3M film was replaced with plexiglass with a resealable access hole to allow desiccant packs to be inserted between the window and plexiglass covers. Each window now has a round hole at the bottom that is used to exchange the dessicant packs once in a while, and also a moisture indicator that points out the approximate time when the packs need to be changed. Sometimes it’s a little hard to see the forest for the trees. It helps to stop over-analyzing things sometimes. It certainly becomes less of a headache when the problem is far less complex than originally thought! In the Control Room, the GBT operator constantly monitors the equipment from the Control Console. The operator is responsible for two main things: the safe operation of the telescope, and the implementation of the different observing programs that various astronomers use. The observation is done in various modes. Normally most astronomers come and “babysit” their programs to make sure they’re getting the data they need, although the trend nowadays is to observe more and more by remote access. The advantage with being there is they can change their program on the fly if adjustments need to be made. Other programs are run over and over, so there’s no need for the astronomer to be there. NRAO operators record the data and ship it off to the astronomers. In some cases, people that do research there win the Nobel Prize. In other cases, there are people who look at their data then chuck it to the circular file and try again. Some of the research pans out and some of it doesn’t. NRAO is a basic research institute and that means a lot of effort is put in to look at things that only matter down the road. In the computer control room, separated from the main area by a glass wall, the collective whir of each of the computers adds up to a somewhat deafening noise. 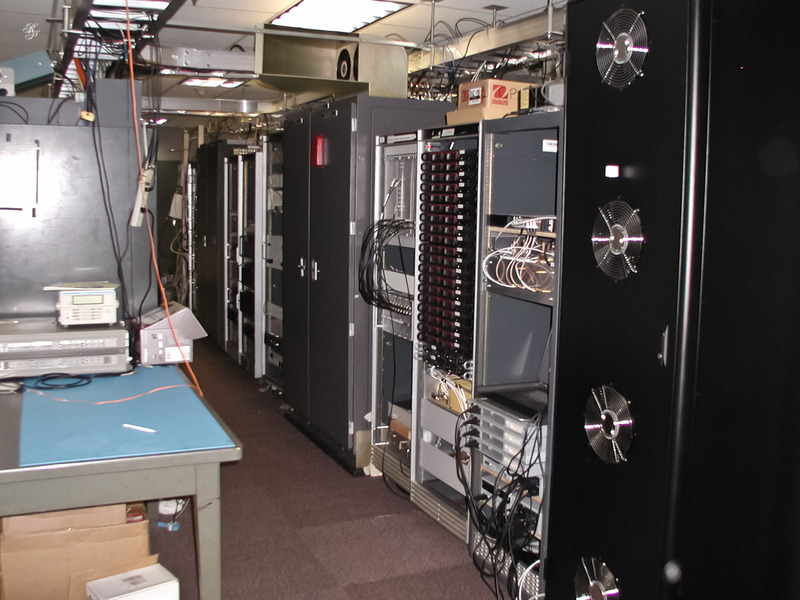 The interesting thing about NRAO is that it has a good mix of both old and new technology. Nowhere is this more apparent than in this room. Most of the equipment in there is one of a kind. The pictures here are worth a thousand words. The synthesizer filters, the front panels, the painting of these panels, is all done in-house. 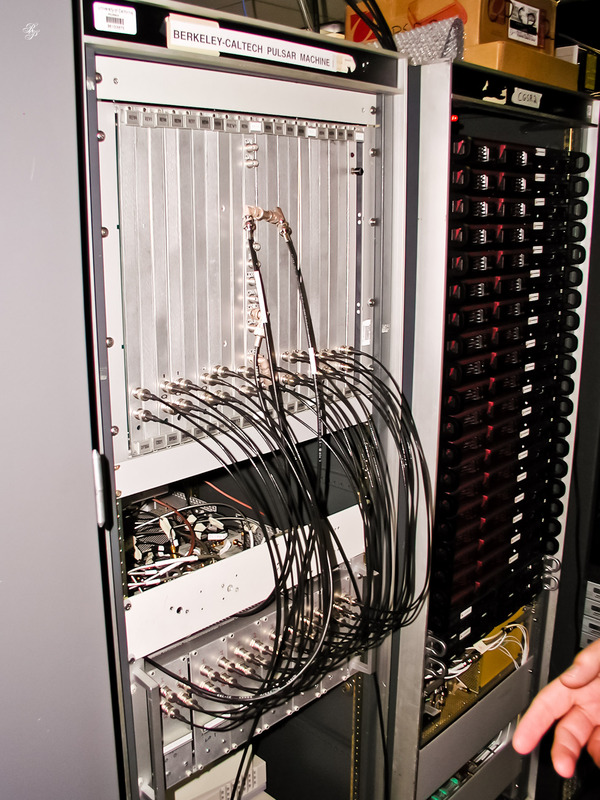 All of the fiber lines from the GBT come right into the equipment room, where the optical signal is converted back into a radio signal. The spectral processor is another big piece they have in the room. Wesley told me to think of it as nothing more than a big radio. 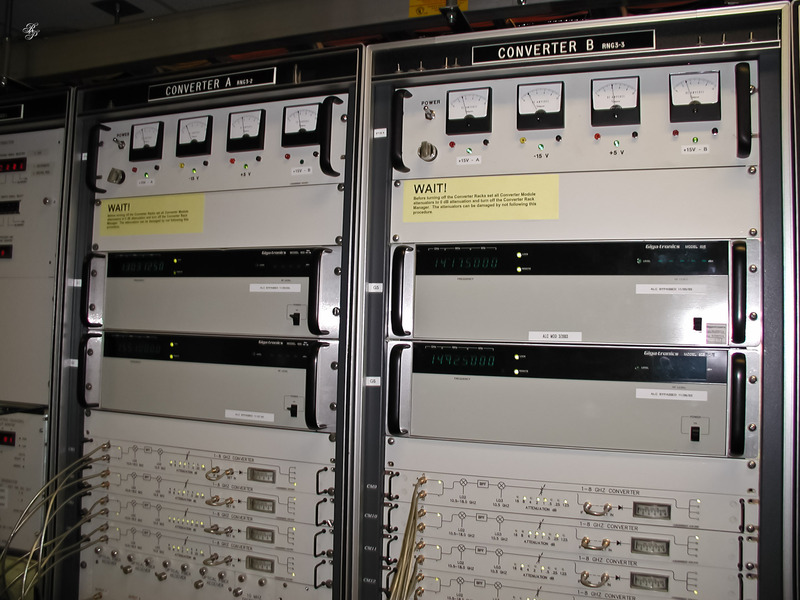 It takes the radio signals it receives and splits them into 1,024 different channels. Then if they have interference on one channel, they can drop it and still reclaim part of the data, provided the interfering signal is not strong enough to overload the first amplifier. The newer spectral process has over 250,000 channels and the technology gets better with each year. If the signal is strong enough to overload the cryogenic amplifier, and drives it into a non-linear portion of its amplification, then everything in the entire band is lost. The data has to be collected again once the interference is done away with. If the interference is there but not strong enough to overload the first amplifier, then they may be able to drop that interference provided it doesn’t occur precisely on the astronomical signal you’re looking at: same frequency/wavelength. That’s what the spectral processor is good at. Inside the spectral processor you’ll find another oddity that’s part of that mix of unique, old and new equipment. The circuit boards aren’t printed (they don’t have the circuits embedded into them) but they are wire-wrapped. The cards have little posts sticking out of them, and wires are run from post to post to post. It’s very old technology, but it works great. 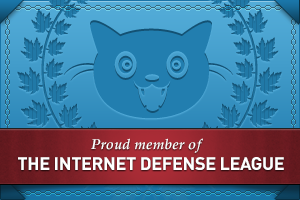 It’s something NRAO has a lot of experience with, it’s very robust, and it’s cheap to do one card that way. If they were going to do dozens of cards, they would ship them out and have them done as printed circuits. They also have equipment manufactured by other organizations. 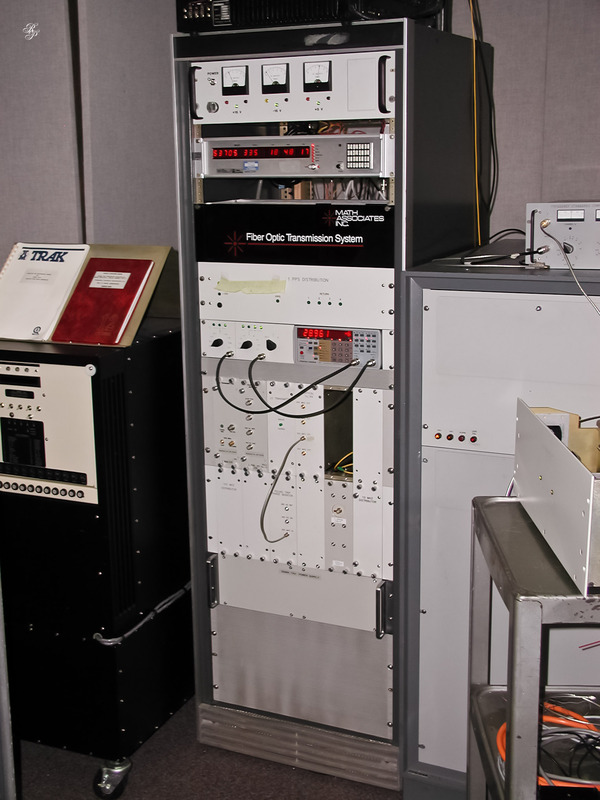 For example, they have a CalTech Pulsar machine. They get very picky about the equipment brought on-site. They have to be careful that it doesn’t interfere with the other equipment there, and especially not with the telescopes. 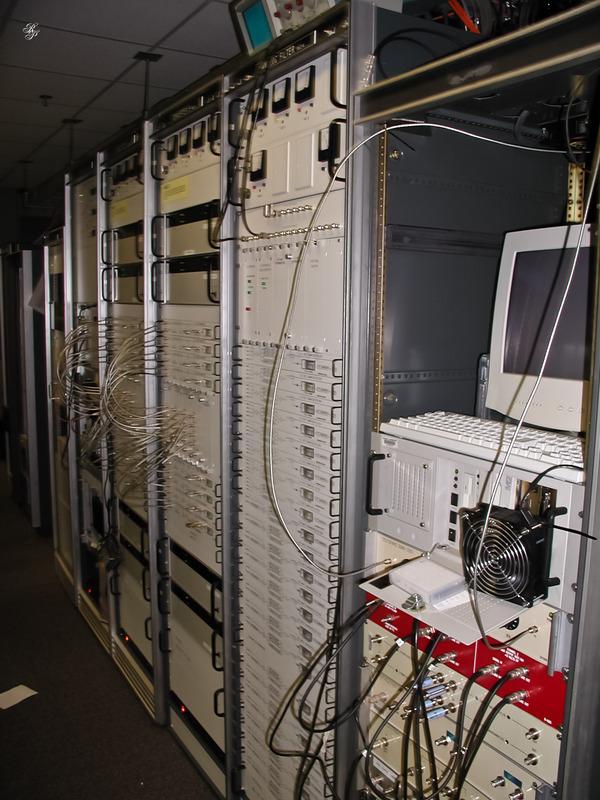 NRAO operates frequency and time standards on the site. Because of the sensitivity of their work, they have to have very accurate frequency standards. They operate a hydrogen maser, a machine that gives them very accurate 5 MHz readings that are piped all over the site. Everything then gets slaved to that signal. They also operate an atomic clock on site that gives a very accurate time standard. The clock may go away in the future, since a time signal just as accurate can be obtained from the GPS satellites. Here Mr. Sizemore pointed out a common point of confusion for many people. Stores sometimes sell atomic clocks or watches. They aren’t atomic clocks as scientists define them. A real atomic clock has a Cesium atom movement in it. The movement of those atoms is used to drive it. The clocks one can buy at Radio Shack or Sharper Image are normal digital clocks with a radio receiver built-in that can tune into the time signal transmitted by our government and set itself. Not quite the same thing. One of their research efforts involves trying to excise interference from the astronomical data, provided, of course, that the amplifier isn’t overloaded. They are looking at a real-time solution, one that would involve an antenna that receives and records only the interference, and the normal dish would record all of the signals. The two recordings would then be spliced together and the interference would be excised. It sounds simple, but it gets more complicated in practice. At any rate, one of the NRAO scientists is working on that very project. And that’s the end of part five. You can also read parts one, two, three, four, six and seven. Editor-in-Chief of a magazine. I have an online portfolio to showcase my writing and editing samples; I have a separate photography blog on blogger.com, and I have devotional Christian writing blog also on blogger. Lots to keep up with. I turned my online portfolio on WordPress.com into a website. I turned off all of the blogging features, although it has a blog on it. You’re welcome to visit. If you read my Home page and About Me page, you’ll see the links to my photo blog. Well I hope to visit you again soon.